Today my article on Content Marketing was published on the Genius.com blog, and I wondered whether I could visualize how Content Marketing is different from traditional public relations and advertising. I came up with two low-fi sketches. I’m interested to hear your opinion on these visualizations. 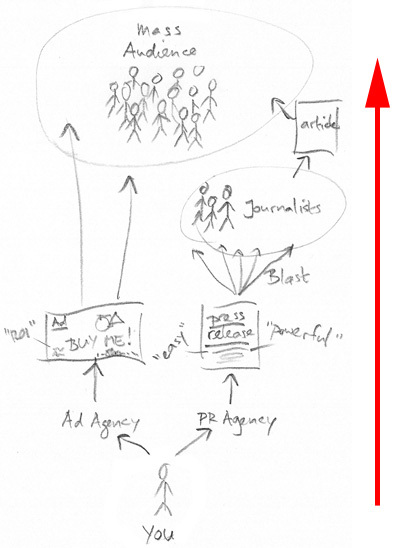 This visual reads from the bottom up: as a marketing manager, you hire a PR agency and an Ad Agency. You give them a briefing, and they create press releases and advertisements that tout your products. They use a lot of superlatives: “easy to use”, “seamless integration”, “powerful” and so on. This is blasted out to a mass audience. Ad Agencies can just buy the ad space to get eyeballs, but you pay dearly for it. PR Agencies blast it out to journalists, try to get some journalists on the phone, and hope they write an article about it. In the new situation your read from the top down. 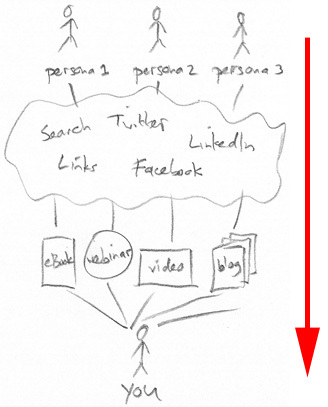 You start defining the personas that you target, and you find out how to reach them through Social Media. You choose the mix of channels that they prefer (ebooks, webinars, video, blogs, podcasts, and so on) and create compelling content. As you get feedback from the prospects, you refine your content in an iterative way. This is a very rough comparison, and it’s easy to come up with objections. For example, in the old situation you were also thinking about your audience, you just didn’t have all the tools to narrow down the audience. And in the new situation it looks like to can do it yourself: however, you probably still need an agency for strategy and/or graphic design. Despite the shortcuts, I hope the images illustrate why Content Marketing is so popular. Let me know your take! This entry was posted in content marketing, Social Media and tagged content marketing, public relations, seamless integration, Social Media on October 20, 2009 by Jep Castelein.